Legislation for the new social security means test rules of lifetime income streams (contained within the Social Services and Other Legislation Amendment (Supporting Retirement Incomes) Bill 2018) passed parliament on 14 February, 2019 and received Royal Assent on 1 March, 2019. These new rules present significant opportunities for retirement income advice, both before and after 1 July, 2019. The new income and assets test assessments for lifetime income streams will commence from 1 July, 2019. 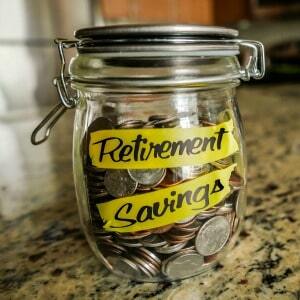 Grandfathering provisions will apply to lifetime income streams that commence prior to this date. The new rules will not apply to fixed term annuities and income streams, account-based pensions, defined benefit income streams or asset-test exempt income streams (for example term allocated pensions). The new rules will assess 60 per cent of payments from lifetime income streams under the income test. For example, where a lifetime income stream pays income of $5,000 p.a., $3,000 p.a. will be assessed under the income test. For deferred lifetime income streams purchased using superannuation, the assessment will apply once income payments commence, i.e. no income assessed during the deferral period. 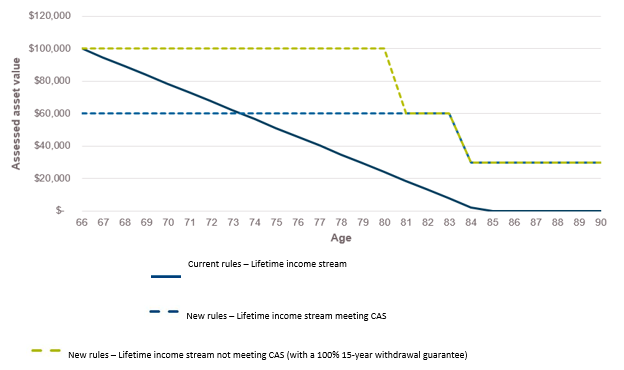 For new lifetime income streams that meet the Capital Access Schedule (CAS) in the Superannuation Industry (Supervision) (SIS) Regulations (introduced as part of the “Innovative Superannuation Income Streams” Regulations) and where the individual has reached their ‘assessment day’, 60 per cent of its purchase amount will be assessed as an asset until the age of 84. After this, the assessment reduces to 30 per cent of the purchase amount for the rest of the person’s life. The assessment day is a new concept that is designed to determine when the new rules will apply to lifetime income streams. The definition is quite complex however for many retirees, this will generally be the day the income stream is purchased. Any current or future death benefit above the limits in the CAS. Chart one compares the current assets test assessment over time with the rules applying from 1 July 2019. Assumptions: Based on a Challenger Lifetime annuity Flexible Income option (complies with CAS) and Regular Income option (with a withdrawal guarantee of 100 per cent at year 15 and does not comply with CAS) for a 66-year old male with an investment amount of $100,000. 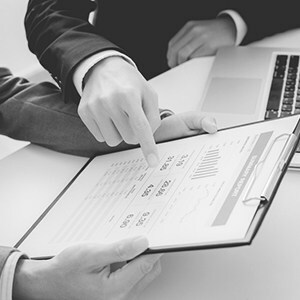 The new assets assessment provides an initial concession under the assets test and maintains this concession for a period of time before providing a further concession in the future. However, unlike the current rules, the assets assessment will never reach nil. These differences mean assets tested part pensioners who incorporate a lifetime income stream into their retirement portfolio from 1 July, 2019 will likely experience higher Age Pension entitlements in the early years when compared to incorporating a lifetime income stream today. Consider Linda and Leon (both age 66) who retired with $300,000 each in superannuation. They are balanced investors with a 50/50 growth/defensive asset allocation. In addition, they have $50,000 in the bank for liquidity and personal assets of $20,000. They desire $60,000 p.a. income to fund their retirement but as a minimum, they require $42,000 to meet needs and essentials. They have allocated $75,000 (25 per cent of their portfolio) each to a lifetime annuity to help fund their needs and essentials for their lifetimes. This also ensures they’re never solely reliant on a single source of income, i.e. the Age Pension. Chart two projects their retirement income under the current rules and chart three under the new rules. Assumptions for charts two and three: Values are in today’s dollars. Rates and thresholds at 1 July, 2018. 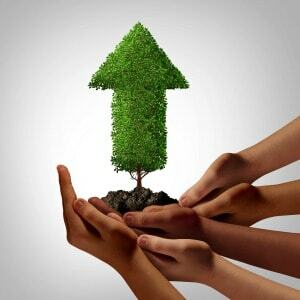 Account-based pension growth assets return 7.70 per cent p.a. and defensive assets, 3.70 per cent p.a. before management fees of 0.80 per cent and 0.60 per cent respectively. In addition, platform fees are assumed to be 0.50 per cent. Challenger Liquid Lifetime annuity (Flexible income option) quoted on 14 August, 2018, monthly payments, maximum withdrawal period, CPI indexation and nil adviser fees. Under the new rules, Linda and Leon experience a higher Age Pension entitlement in the early years ($4,680 higher in the first year) due to the immediate assets test concession. 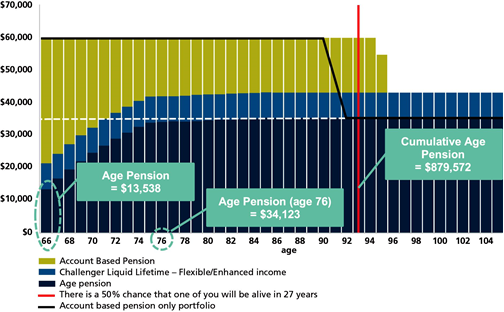 However, this is offset by a lower Age Pension entitlement in the later years due to a higher income test assessment, for example $1,615 lower at age 76. Regardless, in each scenario their retirement outcomes are broadly similar, with an additional layer of lifetime income in addition to the Age Pension to meet their ‘needs’ and their account-based pensions depleting by age 95. The commencement date of 1 July, 2019 for the new rules as well as grandfathering provisions for existing lifetime income streams creates some immediate strategic opportunities. The first opportunity is available to income tested pensioners or asset tested pensioners who will become income tested over the short term. 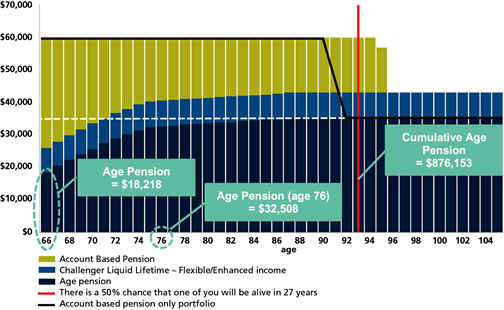 For these clients, and where appropriate, commencing a lifetime income stream prior to 1 July 2019 can provide better Age Pension outcomes as the income test assessment under the current rules (based on a deduction amount) are generally more favourable than the new assessment. The second opportunity is available to clients who prioritise access to capital, instead of higher income throughout retirement, and are looking to use a lifetime income stream that features liquidity greater than the amount allowed by the declining capital access schedule. For these clients, accessing lifetime income streams that offer a withdrawal value higher than the declining capital access schedule before 1 July, 2019 (and grandfathered under the current rules) can provide higher Age Pension outcomes. Where such an income stream was used on or after 1 July, 2019 any higher withdrawal/death benefit value will be assessed under the assets test instead of any current declining assessment or the 60 per cent/30 per cent assessment under the new rules. Minh Ly is technical services manager at Challenger.